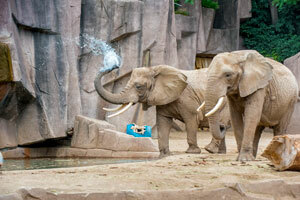 Join in our Girl Scout Elephant Safari! Sponsored by American Transmission Co.
Visit either Saturday or Sunday, and “join a herd” of African elephants to stomp through the Zoo! Girls will learn about the daily life of African elephants; why elephants are a vital part of the African ecosystem and what is being done to protect elephants in the wild. From the ways elephants use their trunks and tusks, to the similarities between elephant herds and human families, girls will come away with a better understanding of what it’s like to be one of these magnificent creatures. All Girl Scouts that participate will receive a Zoo patch! This activity takes place during Party for the Planet sponsored by American Transmission Co., when we celebrate all things green! Open to all Girl Scouts as well as siblings! Learn about African elephants, conservation and the environment. Earn a Milwaukee County Zoo patch. Safaris last approximately 30 minutes. There are limited spaces available for each departure time, so register soon. Sorry, no refunds. $10 for girls or adults (price includes Zoo admission and parking). Zoological Society Membership is not valid for this activity. The Girl Scout Elephant Safari is now sold out.